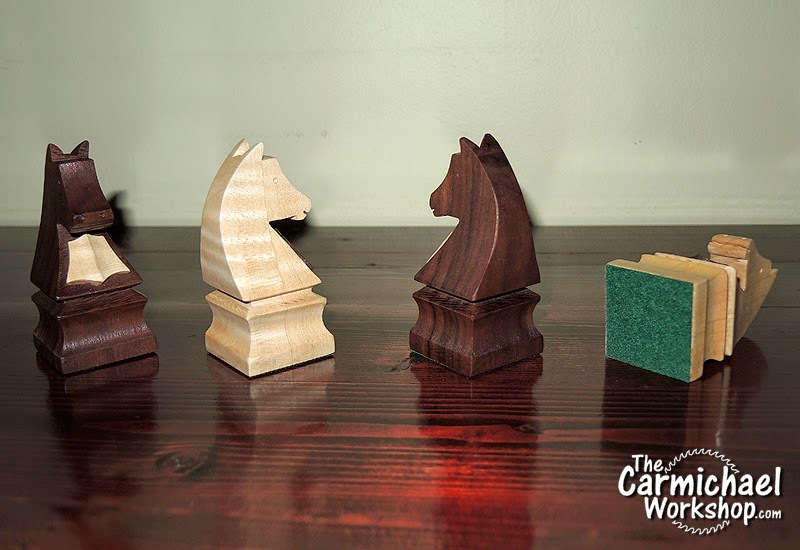 Several people have asked me how I made the Knight Chess Pieces for Steve Ramsey's Chess Set. In case you missed it, Steve Ramsey of Woodworking for Mere Mortals made a chess board in his first series of videos in 2008. He said his second project would be making the chess pieces, but it's been a long-running joke that he never made them. So now, 6 years later, a group of us YouTube woodworkers conspired to make the chess pieces for him, and I was assigned to make the knights. Click here to see the chess pieces at the end of Steve's Mere Minutes video. 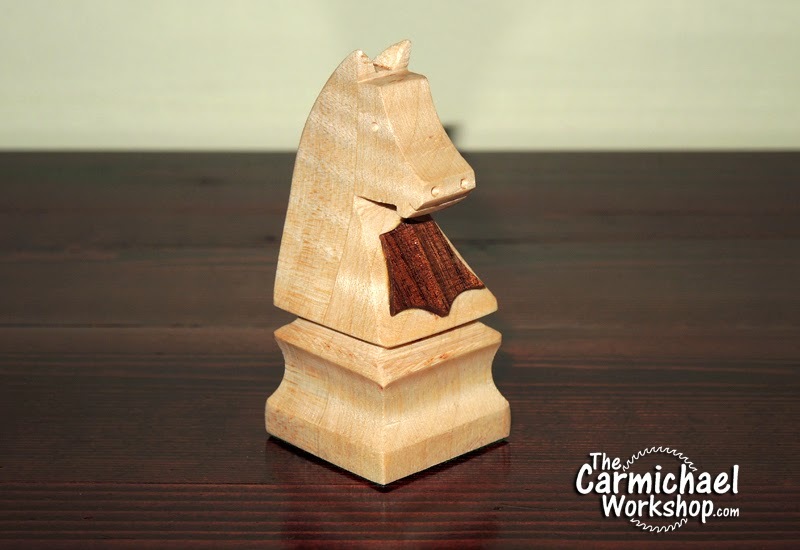 Click here to see all of the chess pieces and who made them on Mike Fulton's site. Typically, chess pieces are scaled to fit the size of the chess board. Steve mentioned in his video that his chess board has 2" squares, so we scaled the pieces proportionately. 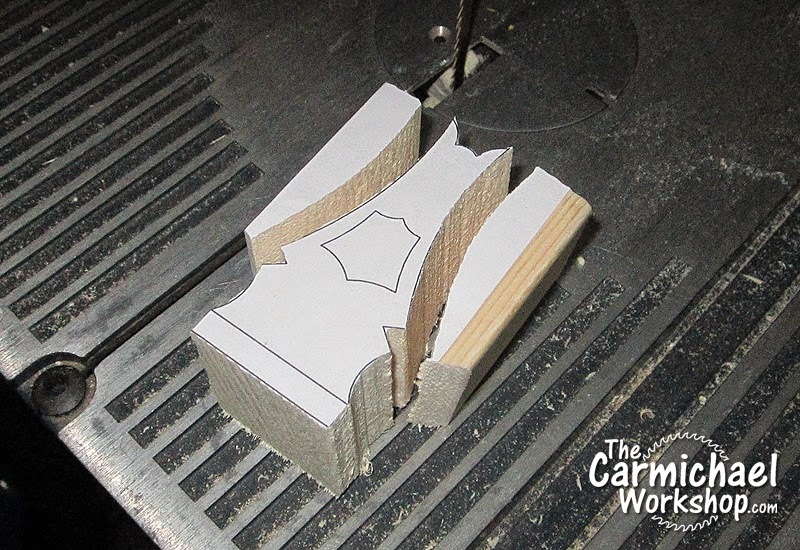 The base of each piece should fit within a square with a little breathing room. The height of each piece graduates from the pawns (shortest) to the king (tallest), and the height should be proportionate to the square size. There are charts online to help with this. It took some coordination among us woodworkers to make sure each piece was the correct size in relation to the board and the other pieces, and we agreed to use walnut and maple for the pieces to match Steve's chess board. When I was assigned to make the knights, I knew I couldn't turn them on the lathe like the other pieces. So, I decided to use the same 3D cutting technique that I used on my Bandsaw Vase project. I looked at lots of knights and found a basic horse shape I liked on The Chess Store. 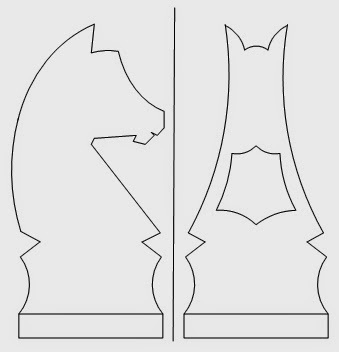 Their chess pieces are really detailed and fancy though, so I had to draw up a much simpler two-sided pattern that would be easy to cut. The knights ended up being approximately 1.5" square and 3.25" tall. Click here for a PDF of this pattern. If you are looking for a nice chess set, visit The Chess Store. The key to 3D cutting is attaching the template to the block so that the fold line is precisely on the corner of the block. Cut the front view first, then tape the long curved cutoff pieces back in place with clear packing tape. You may need to attach another copy of the side view template since some parts of it get cut away. Cut the side profile then remove all of the cutoff pieces to reveal the knight. Sand using a spindle sander, small files, and sand paper. Cut out the optional shield from thin stock and glue it on. I shaped the shield with a spindle sander to give it a raised crease in the middle. 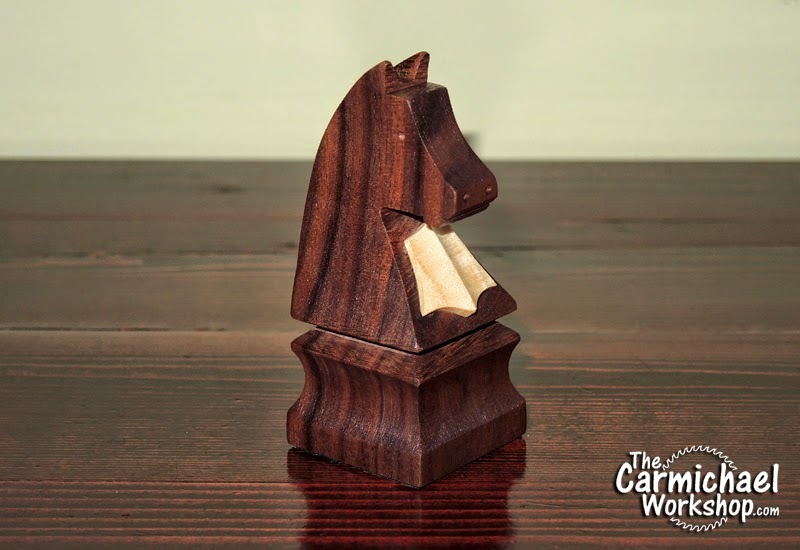 This was a fun and challenging project and I was happy to be a part of the fine group of woodworkers who joined together to make Steve this chess piece set. 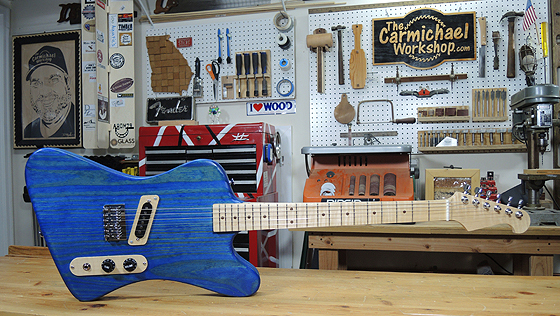 Thanks to Mike Fulton for herding us woodworking cats in the right direction. Getting everyone to make their pieces at the right scale and ship them on time took lots of coordination. Below is a list of everyone who participated in this project . 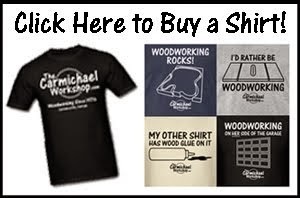 Please visit and follow them for more woodworking goodness! Thanks guys for including me and thank you to Steve Ramsey for inspiring all of us! 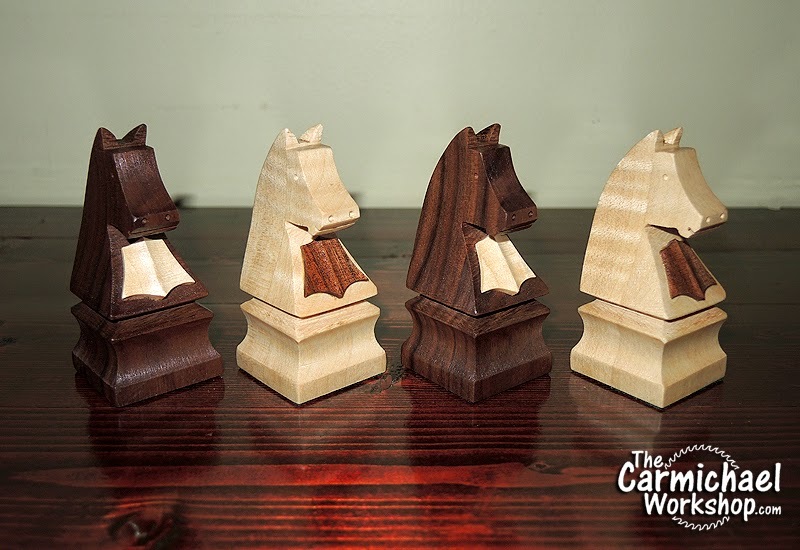 To see the entire set of maple and walnut chess pieces, click this picture! Would you like a slice of Palletroni Pizza? 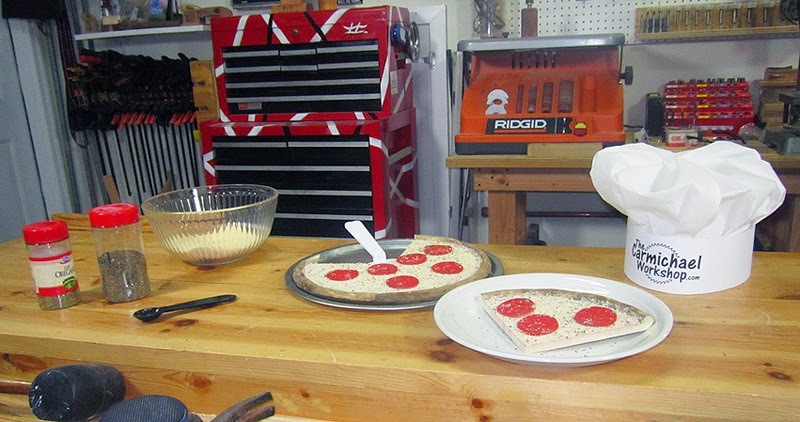 Following the appetizing success of my 2x4 Wooden Sub Sandwich, I decided to have some more fun and make a wooden pepperoni pizza. 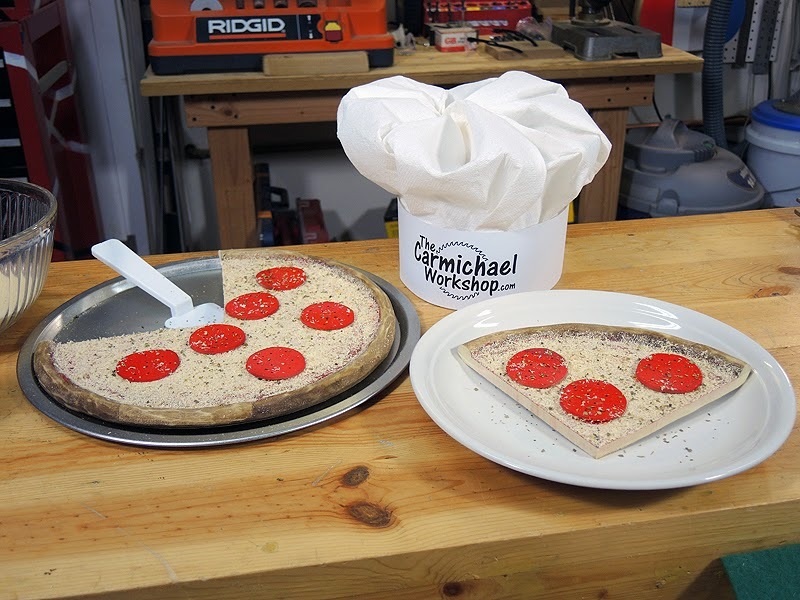 Watch me make this delicious Italian delight below. This project is for the Pallet Up-Cycle Challenge hosted by Sterling Davis, where you can make anything you want out of a pallet and enter to win prizes in a random drawing. The deadline is December 24th, 2014 so hurry if you want to enter. I used poplar slats that I salvaged from a pallet about a year ago. I prefer to just cut the good parts off of a pallet and trash the rest. It's quicker and easier, plus I avoid wrestling with nails and possibly splitting the wood I'm trying to save. Pallets can be used for all sorts of practical and artistic projects, so get creative! The next time you see a stack of pallets, maybe you'll think of a stack of Palletroni Pizzas instead! Winners, Giveaways, Snow Scene, Ornaments, Pencil Holder, and Happy Holidays! Congratulations to the winners of my MicroJig Giveaway! Russell Roefer won the GRR-Rippers and John Ferguson won the GRR-Rip Blocks! Thanks to all who entered and thank you to MicroJig for the awesome prizes. Here is my latest Sidebar Conversation about the giveaway and follow-ups on my recent projects. Russell and John were selected randomly via random.org from 1,963 entries and their names are displayed automatically in the widget below. They have been contacted and confirmed, and their prizes will be shipped soon. Thanks for making my first giveaway a lot of fun! Make a Holiday Snow Scene on a Lathe! This project began as a practice exercise for learning how to use different woodturning tools on my lathe. Since the holidays are here, I decided to design a Snow Scene that would make a nice decoration if all went well. Watch my video of this project below. You will need a 1.5"x1.5"x11" turning blank. A little extra length would give you a little more breathing room. You will also need a piece of wood about 7" long for the base. Mount the blank on the lathe between centers and turn it round. Use the Story Stick on the template to mark the transition points and draw the lines around the work piece. Tape the story stick to your tool rest or keep it nearby to use as a guide. 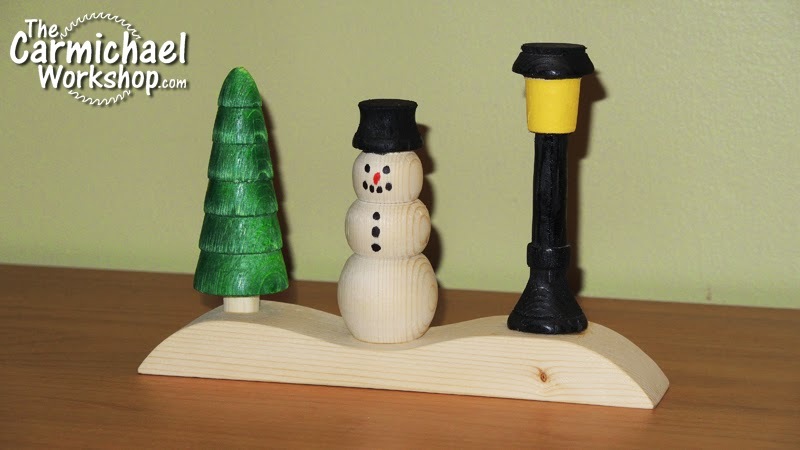 Use your different woodturning tools to finish turning the tree, snowman, and lamp post. I started with the thicker portions and worked my way down to the thinner areas for stability. Sand the pieces and cut them apart. Clue the pieces onto the base and paint as desired. This was a fun practice exercise and it appears that I may actually be getting pretty good at this woodturning thing after all! With each project, I am gaining more confidence in my lathe skills and I'm learning which tool to use for different types of cuts. I think I will design some more of these practice exercises real soon. Bandsaw Boxes Make Great Gifts! Every year I find myself making some bandsaw boxes for Christmas gifts. People really like receiving them, especially with a special surprise hidden in one of the drawers. 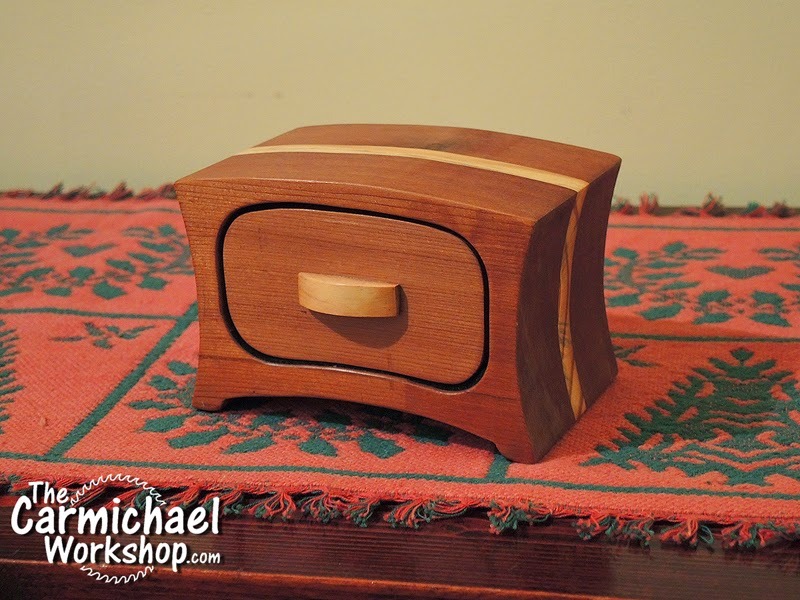 Below is a bandsaw box that I made recently while live on the air on The Summers Woodworking Show. If you like this design, click here to download my free PDF template. Below is the video recording of the show where I made the box and explained the process I go through while making these great gifts. 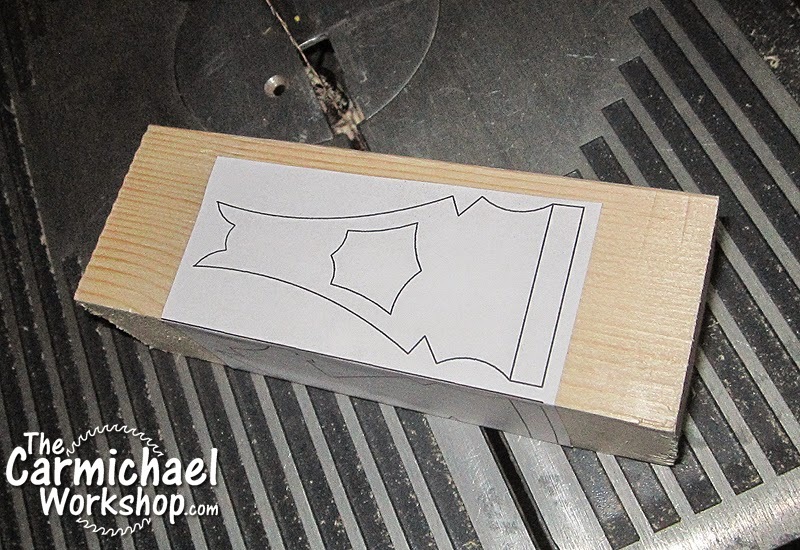 If you would like to see my other bandsaw box designs, visit my Project Plans page for pictures and more free templates. There are other great gift projects there too. Don't forget to put a little surprise in one of the drawers!